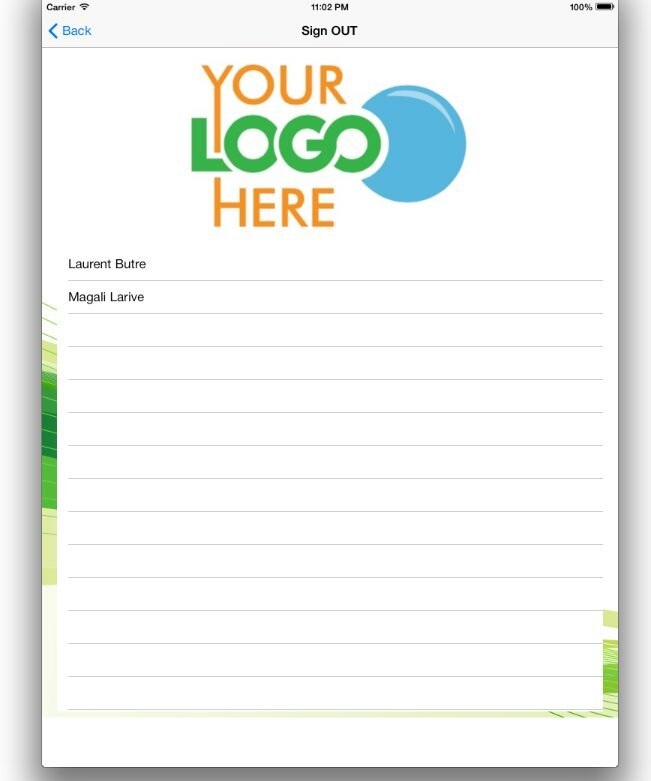 Digital Visitor Log Book - Self Register. You may not have a lobby as modern as the one above, but here is the App that you need. 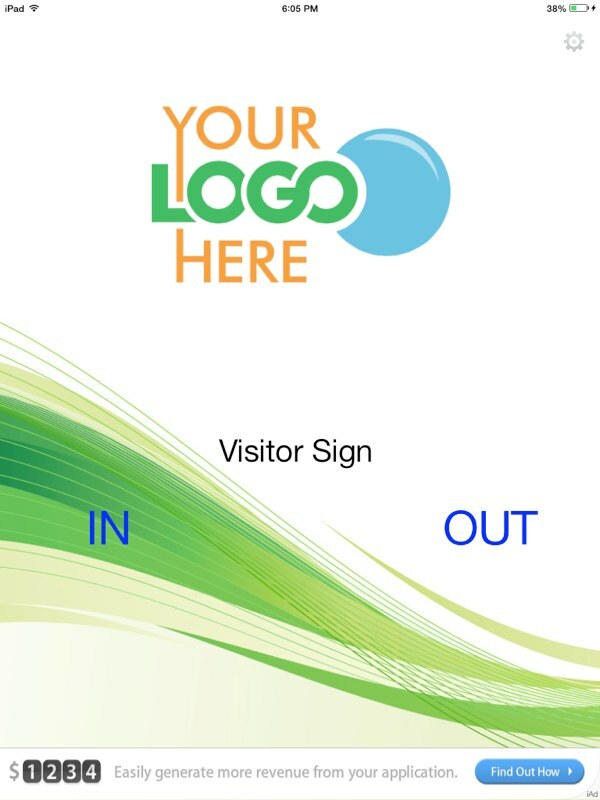 Elegant, modern, reliable and easy way to Sign in your visitors. As simple as 1, 2, 3. Capture their picture or Driving License. 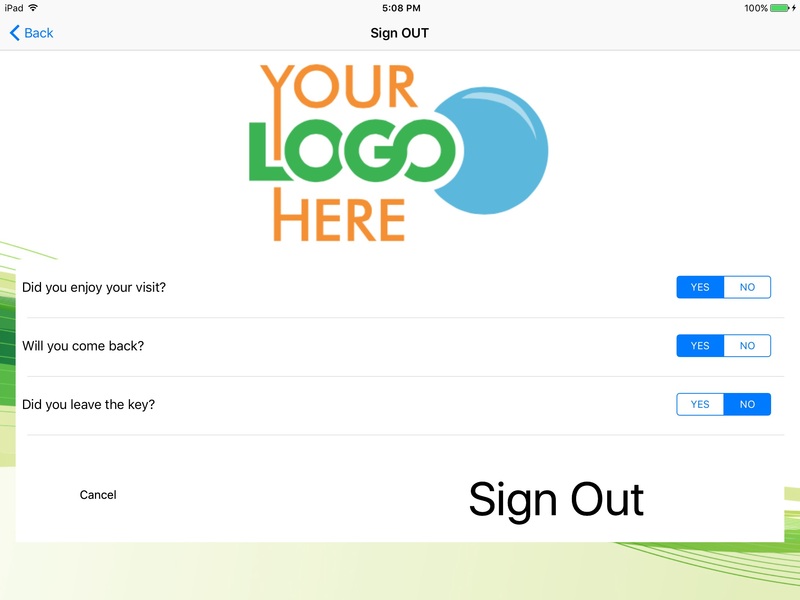 Turn your iPad into a Self Register Kiosk and Download the App. 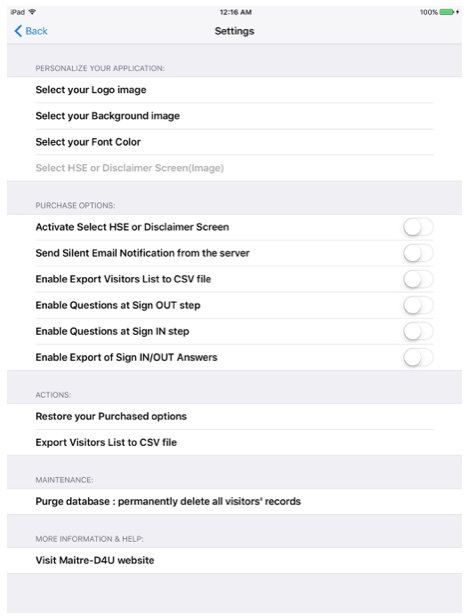 Many features can be activated, like : Taking pictures of visitors or their ID cards, Asking Questions at Sign In or Sign Out, Requiring Acknowledgement of T&Cs or HSE information at Sign In, etc. Coming soon... synchronize several iPads with Sharepoint integration. Register to get notified. Here are a few Label Printers which have been tested with Visitor Log Book. The communication between the iPad and the Label Printer is done via the Apple AirPrint protocol. Therefore make sure that the printer that you select and want to use is compatible with AirPrint over Wifi. Here are some model which we have tested with their supply reference. You can activate this option and force your visitor to acknowledge your safety guidelines, evacuation information or disclaimer. 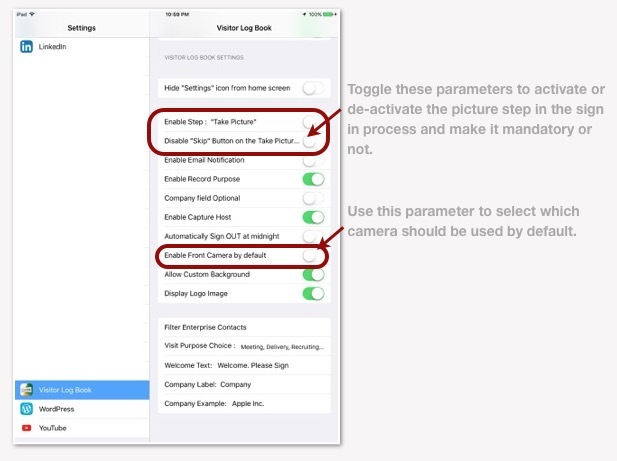 This is very simple, use one of your saved picture from your pictures library of your iPad. 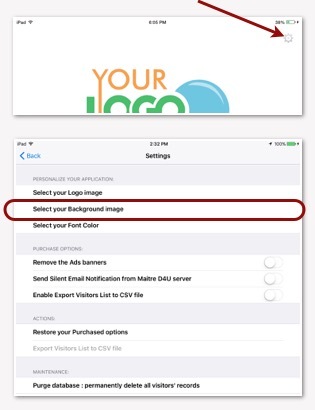 Select that picture in the application settings (same screen as the purchase option) and that image will be used as a background to the acknowledgement step during sign in. For your convenience, here are a few Photoshop templates to design your HSE/Disclaimer image. 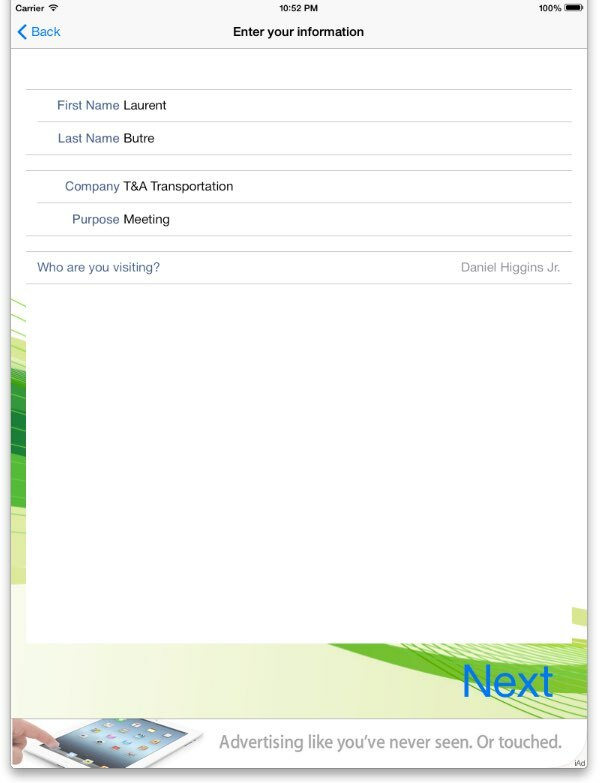 Replace your traditional visitor log book with a modern customizable iPad version. 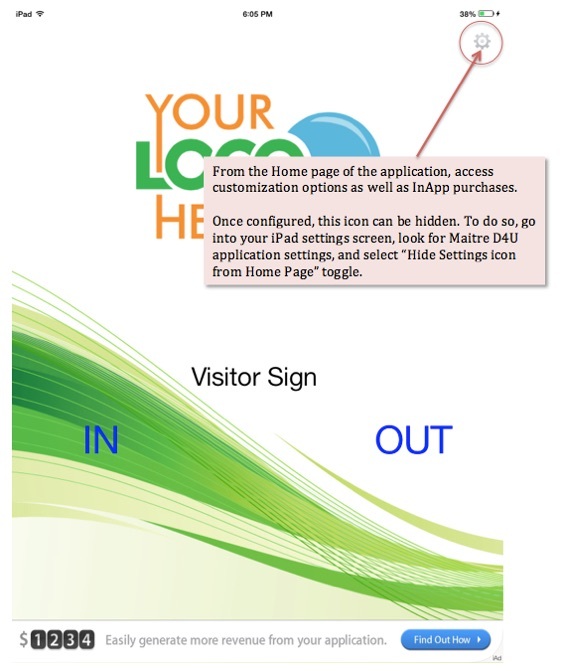 Curious about how it works, here are some interface snapshots of the iPad Maitre D4U SelfRegister App. But don't stop there, the application is on the App Store. So click here, download it and see by yourself. It will perfectly fit your need, so easy to use that you will love it. In App purchase, Ask up to 3 questions to the visitor during the Sign In process. 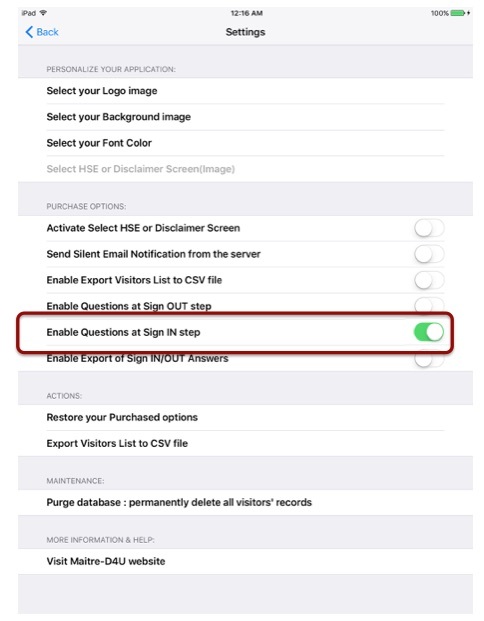 In App purchase, Ask up to 3 questions to the visitor during the Sign Out process. 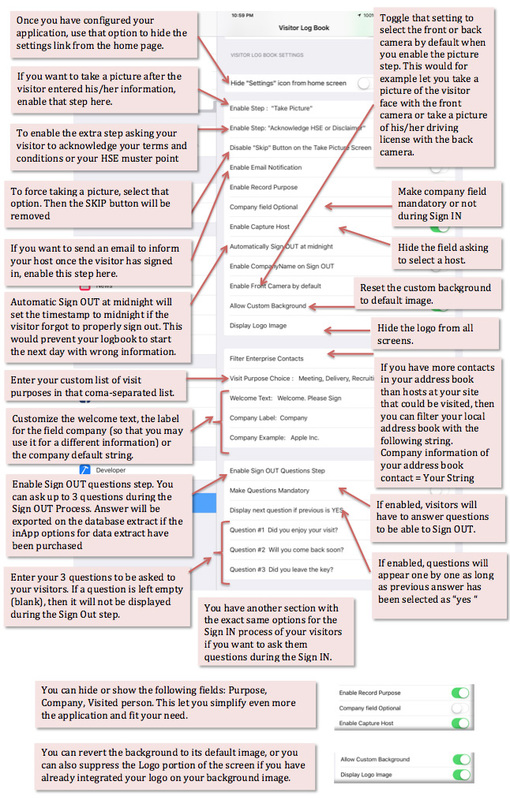 Here is the description of the different options that you can select for your Visitor Log Book. 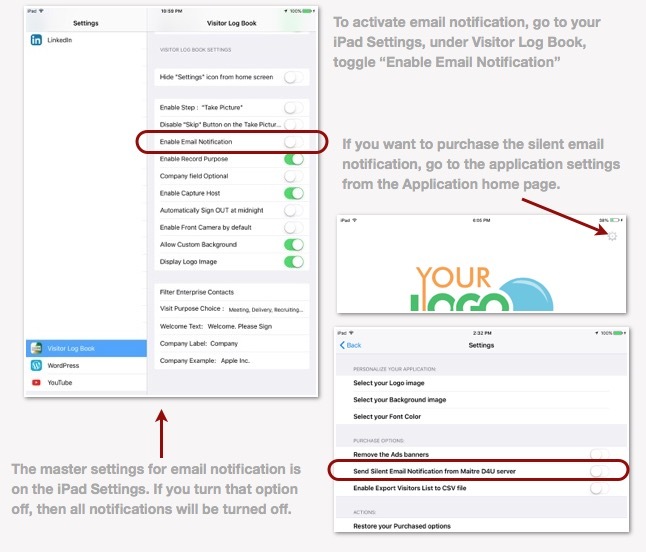 You will find settings under the iPad -> Settings -> Visitor Log Book as well as from the home page of the application by clicking on the Settings wheel. 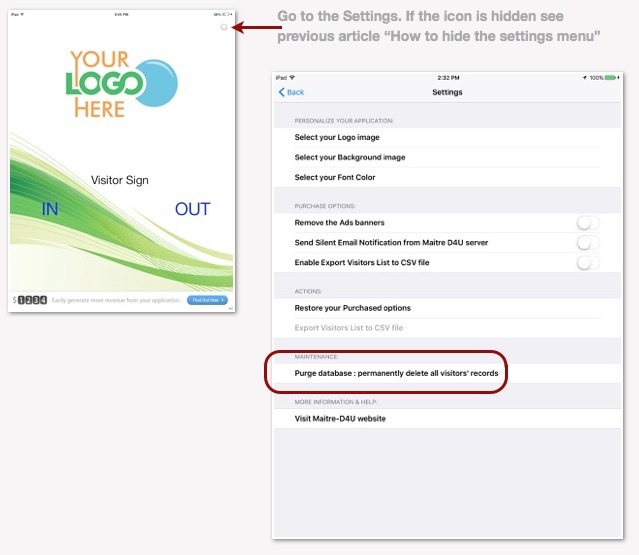 This home page settings wheel can be hidden once you have customized your application. 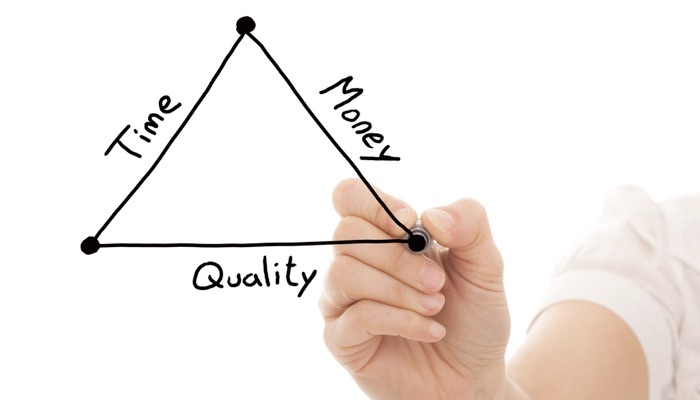 Review these different articles to help you customize your application. Probe your visitors and ask them up to 3 questions, Like "Did you come via public transportation?" 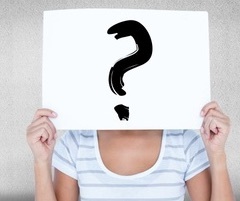 Probe your visitors and ask them up to 3 questions, Like "Did you return your badge?" If the default color of the font doesn't work for your background, you can select a different color from the palette of color. Access that screen from the Parameter page of the Application. This is from the Parameter wheel from the home page. Once you have configured the settings from the home page, you can go to the setup page of the application and hide the settings icon. This will prevent any change to your application settings. If your visitor database becomes too large, or you have already extracted all the information that you need, you can select the "clear database" option from the settings menu. This will permanently delete all data from your visitors. You cannot recover them. If you want to notify the host of the arrival of your visitor, you can activate free of charge the option from the application option menu. 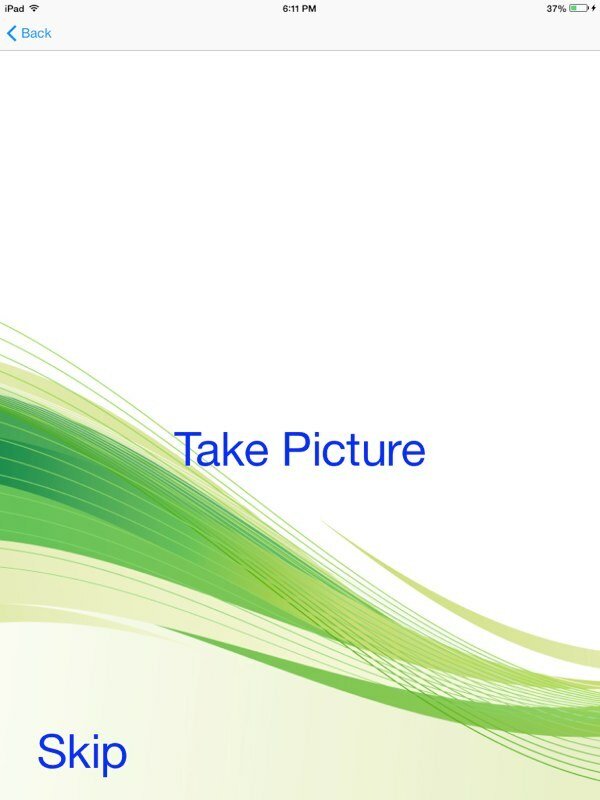 This will present an email template after the capture of the picture (or just after the visitor information if the picture step has been suppressed). The visitor can then simply add any comments, or push the send button to notify of his arrival. If you want that notification to be silently sent in the background, you can purchase the option. 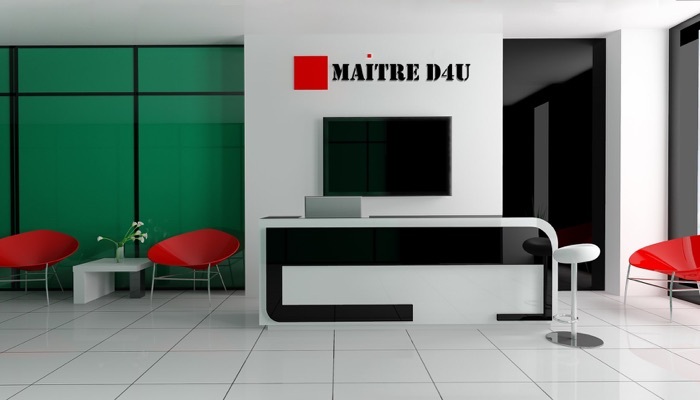 When the visitor registers, the App will contact the Maitre D4U server and pass the information for the email to be sent from that relay. Internet connectivity will be required by the iPad for that feature. If you like this App and you would like to use it without the Ad Banner, you can simply de-activate the banner from the setup screen. This is an in-App purchase option. One really important information when you have a visitor is to know and inform who that person will meet with. It is extremely simple to import your facility staff in this application. 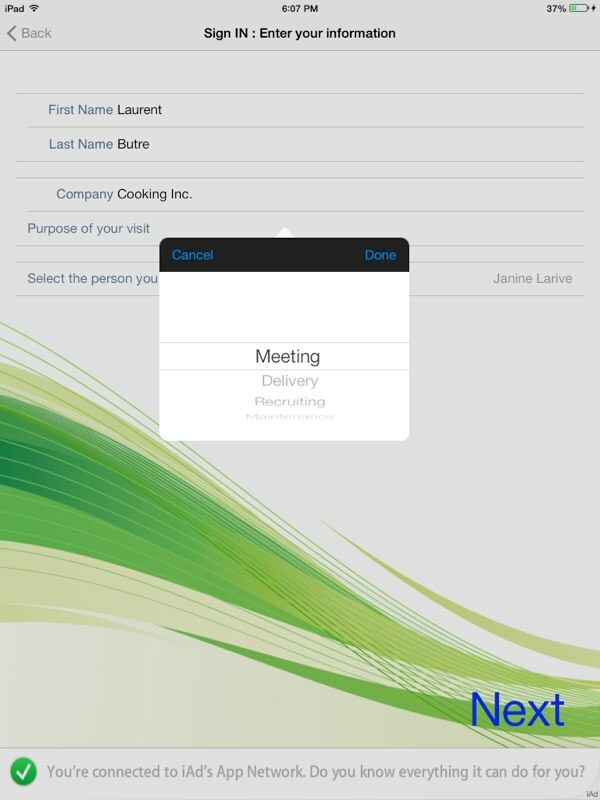 Synchronize your local address book with the iPad. If you need to display only a subset of these contacts, you can use the "Company" field to filter them via he Application Settings. If your local contacts have an email, the application has the capability to send immediately an email to the visited staff. In some cases you may not want to capture a picture of your visitors or a photo of their Driver's License. You can easily deactivate that feature from the Setup screen. With a regular handbook log, stats can take forever. 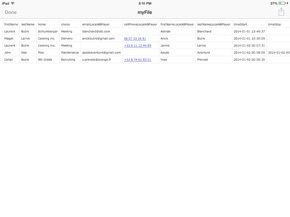 With this App, you can export into Excel the captured visitors information. 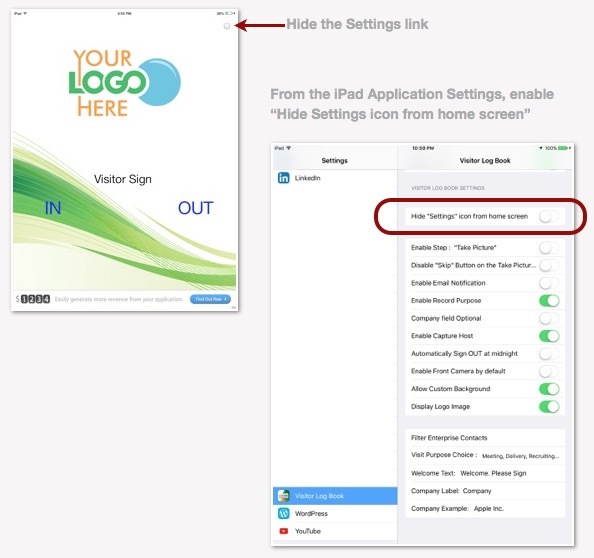 This feature can be activated from the Settings screen and is an InApp purchase option. 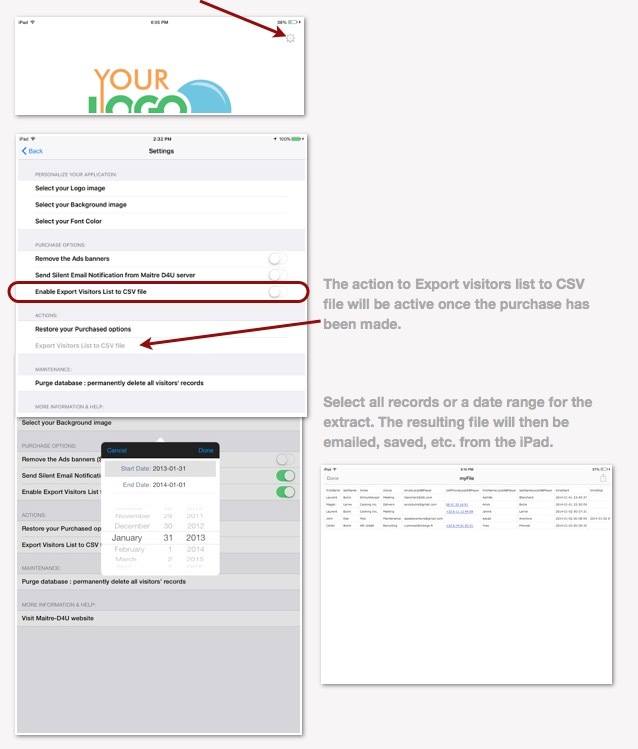 Once the feature purchased, you can request the entire database to be exported to a CSV formal file or you can select a set of dates to be extracted. 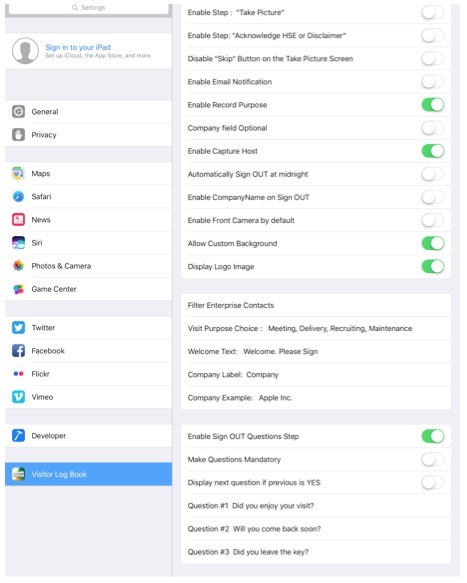 If you have an evacuation, you can easily grab your iPad and check rapidly how many visitors are in your facility, no need to have to scan through your paper log, find out who has not already signed out. With the SelfRegister app, simply look at who should be checking out that day. It means they were still inside the facility. Streamline your reception area. Remove that paper handbook log. Visitors information accuracy is increased when digitally captured. Visitors information quality is improved when pictures are taken. Deploy multiple synchronized iPad stations to reduce check in time. 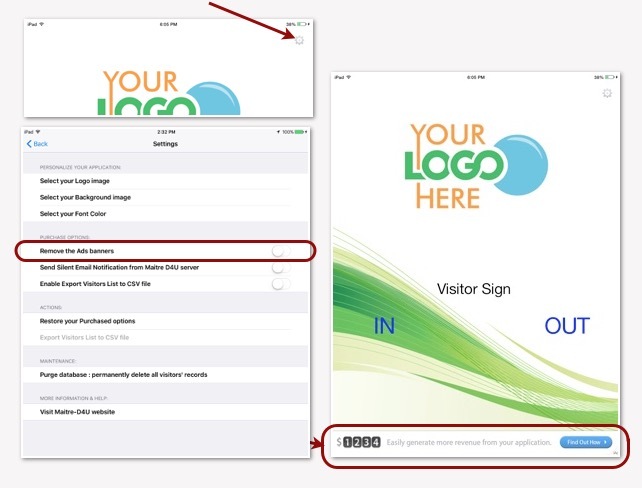 Your facility has multiple entries for your visitors or the number of visitors justifies the deployment of multiple iPads to capture your visitors' information. We can synchronize them together. You can use either your existing Sharepoint site to record your Visitors list or follow these steps to provision a new Sharepoint site on one of the cloud provider. The steps are described on the Apps4Rent platform which we currently use and have a material connection with. Customize your application. 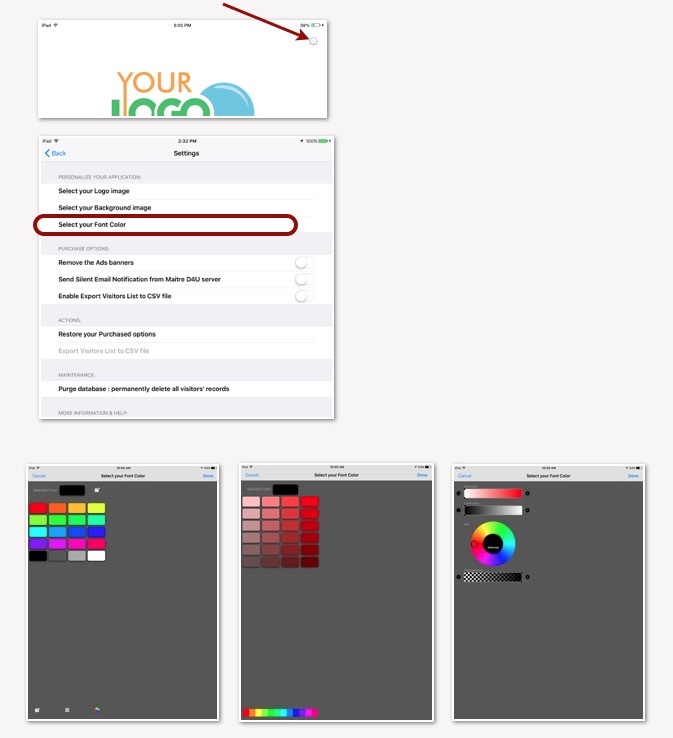 Not only you can set your logo, but you can change the background of the screens. Use one of the picture from your iPad photo library. To setup printing, simply purchase the option from the Settings screen. Then use any AirPrint Label Printer to print your stickers for your visitors. Here are a few Label Printers which have been tested with Visitor Log Book. The communication between the iPad and the Label Printer is done via the Apple AirPrint protocol. Therefore make sure that the printer that you select and want to use is compatible with AirPrint over Wifi. Here are some model which we have tested with their supply reference. 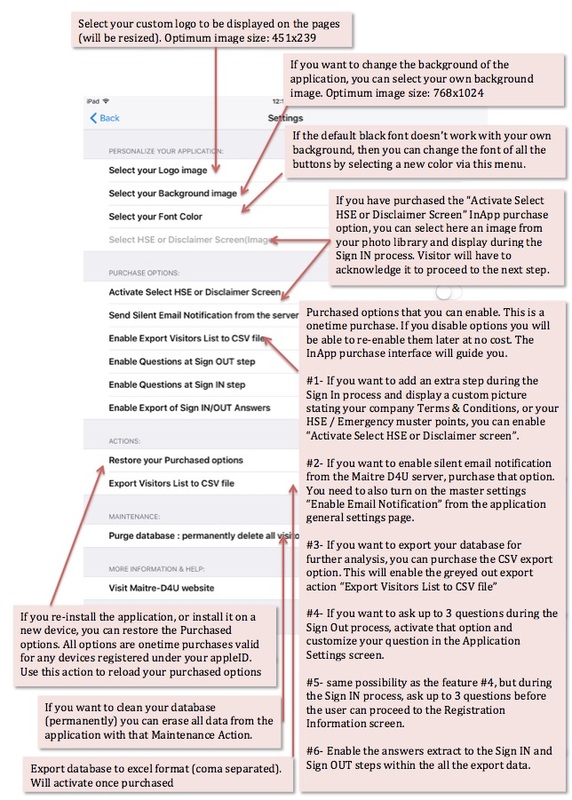 Go to the application parameters screen and purchase the InApp option "Enable Questions at Sign OUT step". Then go in the Application Settings screen to configure your Questions (up to 3). You can decide if you want to make them mandatory. You can also decide if you want to display them in sequence (if the previous has been answered yes), or in block. 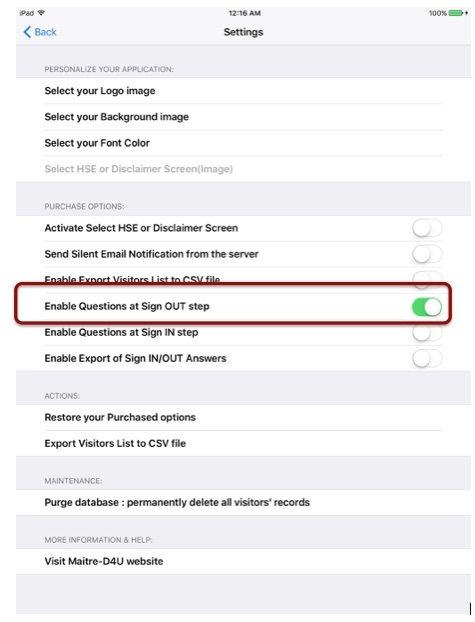 Go to the application parameters screen and purchase the InApp option "Enable Questions at Sign IN step". Then go in the Application Settings screen to configure your Questions (up to 3). You can decide if you want to make them mandatory. You can also decide if you want to display them in sequence (if the previous has been answered yes), or in block. Only 3 screens, as simple as 1,2,3: Sign in, Take a picture (optional), Sign out. In case of evacuation, simply take the self register iPad and see immediately who needs to check at the Muster point. Account for your visitors. Understand who comes to your facility. Easily see who is the most visited, which company is visiting more often, Understand the busy days and hours for visitors. Optimize the hours and staffing of your reception.